Terumi Imamura (今村照美) is a migrant from Sasebo, Japan to Los Angeles and a comfort woman denier. She has been in the leadership position at True Japan Network, a denier organization of Japanese people in the greater Los Angeles area. She spoke out against the proposal to enact a comfort women memorial in San Francisco at the Board of Supervisors meeting in summer 2015 (along with Koichi Mera, Yoshi Taguchi, and Mariko Okada-Collins) and facilitated a denier panel at the UN Commission on the Status of Women Parallel Events (2016) featuring Mio Sugita, Koichi Mera, and Kiyoshi Hosoya. For information about Texas Daddy Japan Secretariat (テキサス親父日本事務局), see Shunichi Fujiki. 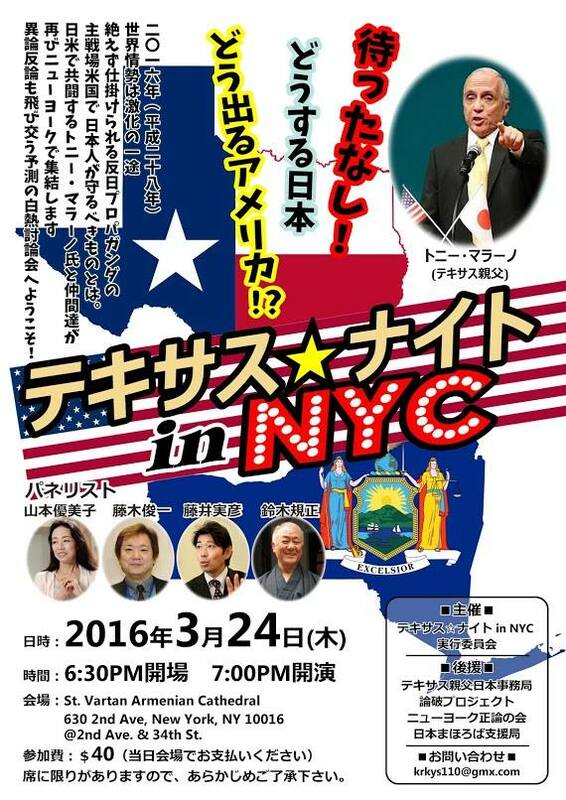 Texas Night in NYC (2015) is a series of two Japanese-language panels held on March 9 and 12, 2015 in New York City. 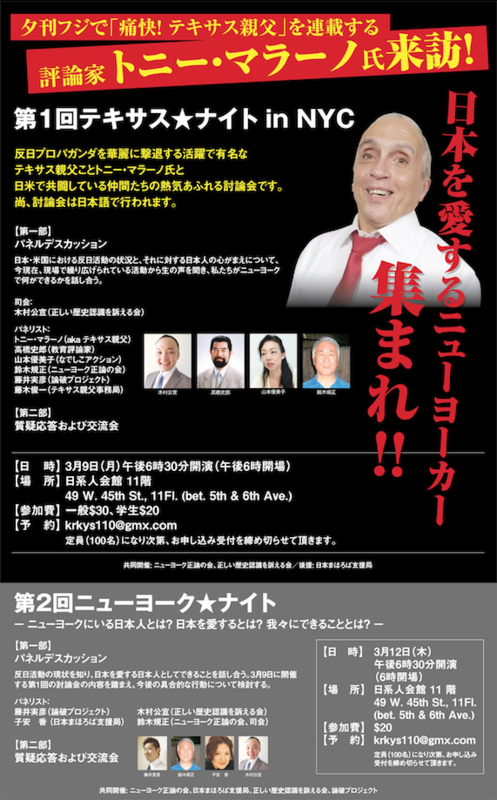 It was officially sponsored by New York Seiron-no Kai, Japan Mahoroba Support Agency, Society to Promote Correct Historical Views (Happy Science), and Rompa Project, but in New York the event was billed as a Happy Science event. The first panel was cancelled by the original venue, Japanese American Association of New York, after the association found out Yamamoto’s history in violent racist group Zaitokukai. The event was moved to an Italian restaurant nearby, where protesters gathered outside. 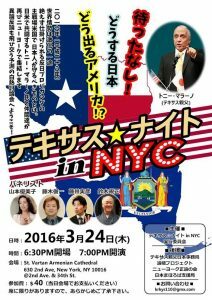 Texas Night in NYC (2016) is a comfort women denier event held on March 23, 2016 at the St. Vartan Armenian Cathedral in New York City. This is the second consecutive year a “Texas Night” event is held in New York, after Texas Night in NYC (2015).